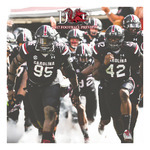 University of South Carolina, Office of Student Media, "The Daily Gamecock, Football Preview, Thursday, August 31, 2017" (2017). August. 4.